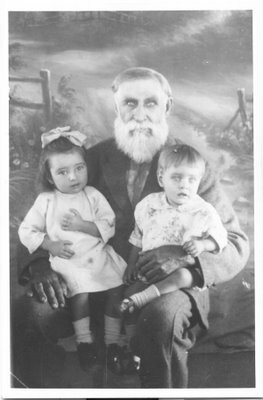 My mother and her brother with their grandfather. What mysterious eyes your Great Grandfather has. I imagine he was around during the Boer War, wasn't he? Your great grandfather looks angry in that photo! What a treasure of a photo to have! Not too many people have a photo of their Great-Grandfather. 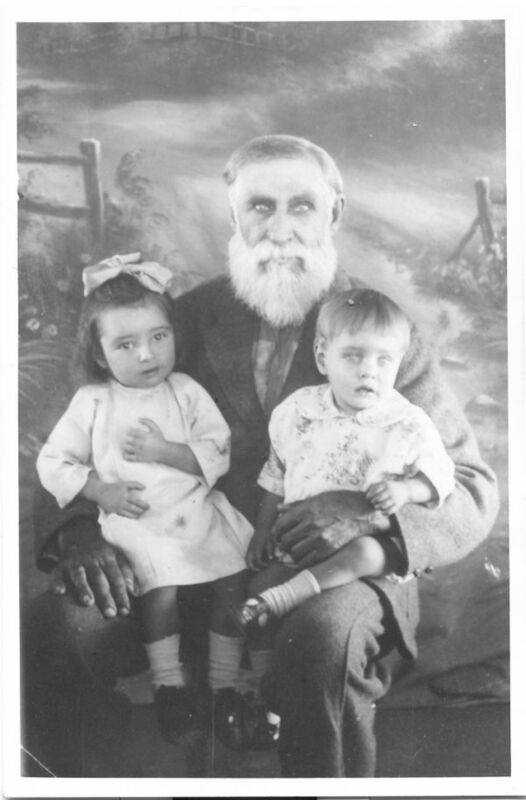 I think the lighting from the right side of the photo may have something to do with the Grandfather's eyes looking a little fierce. The little boys eyes take on a similar cast, as well. Imagine the things your great-grandfather saw in his lifetime. Ahh, if pictures could talk...they'd be movies. Holy crap that pic rocks. I didn't know you were related to Rasputin! He looks like one of the Patriarchs out of Smiths novels ...maybe a deacon of the Dutch Reformed Church..
Rasputin is a minor cousin and the novels Smith wrote about is just conjecture, and photo's become movies and then MY EYES start looking at you, beware. What an incredibly rich photo. Bless them all. Now I realize that it is a good thing to have ancestor worship. Time to light some fireworks, have a real display. And, your Mothers flowers are beautiful.